Even though it seems a bit late this year, winter will eventually be upon us. The freezing temperatures will not only make your heating bill rise, they could also cause potential hazards to your safety. By taking the time to follow these seven tips, you will not only save money this winter, but reduce your exposure to hazards. Seal all air leaks in ductwork with foil faced tape. Duct tape does stick securely to galvanized metal. Add insulation wherever needed. Install a programmable thermostat and set it at 68 degrees or lower. You will easily save the cost of the thermostat the very first winter. Make sure all heat registers are not covered up with rugs, furniture or drapes. Air flow is important in maintaining optimum temperatures. Replace your furnace filter every three months at a minimum and every month during heavy use. Reverse the blade direction of your ceiling fans in order to circulate the heated air. Install a carbon monoxide (CO) alarm in your home and place it on the wall 2-3 feet above the floor rather than by the smoke alarms. Carbon monoxide is a heavy hazardous gas that you cannot see, taste or smell. Make sure your natural gas meter is always clear. Leaves, snow and ice can interfere with the operation and even cause a safety hazard. Build up can also block natural gas exhaust and air intakes, increasing your risk of CO exposure. 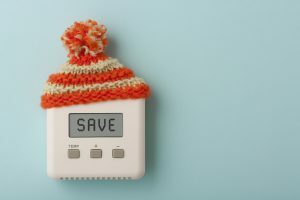 It’s always good practice to conserve energy, but when you can combine it with saving money, it’s even better; not to mention protecting yourself. Weatherization and Energy Efficient Building is just one of the course options we provide to builders and contractors across the nation that will fulfill their builder or contractor license continuing education.